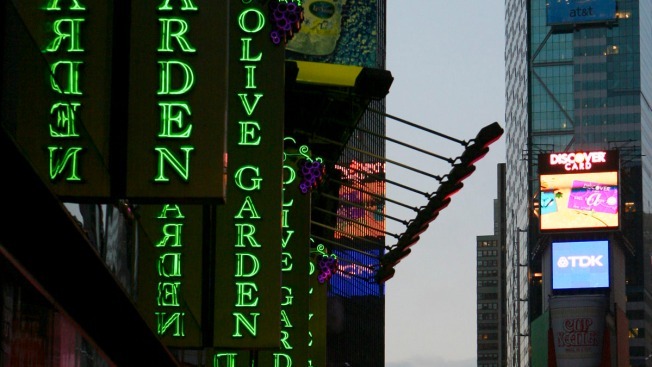 Olive Garden and other Times Square restaurants are charging hundreds of dollars or more per person for New Year’s Eve dinner, according to reports. Restaurant-goers will have to shell out $400 each if they want to ring in 2016 at the Olive Garden’s location at 47th Street and Broadway. And while there will be a DJ, open bar and buffet there, the views of the ball from the restaurant are “limited,” according to the manager, and none of the famed breadsticks will be served, the New York Post reports. Dinner is even more expensive at the Bubba Gump Shrimp restaurant, which at 44th Street and Seventh Avenue is just below the ball. Revelers will have to pay $799 if they want to eat there and maybe catch a glimpse of the ball. Ruby Tuesday and The Counter, two blocks south of the ball, are also getting in on the action. At Ruby Tuesday, tickets are $349 per head and $1,699 for a “Couple’s VIP Table.” At The Counter, partiers can pay $449 for mini hamburgers, fries and an open bar. Neither restaurant sports views of the ball drop. A “couples VIP” dinner of pasta, chicken and salmon at Italian chain eatery Buca di Beppo is $999. Still, the prices may be worth it to those who don't want to wait out in the cold for 12 hours without food or a bathroom.